GAUGE Approx. 25 sts and 26 rnds in single crochet with hook U.S. E-4 / 3.5 mm = 4 x 4 in / 10 x 10 cm. Adjust hook size to obtain gauge if necessary. The Gävle goat is crocheted tightly with a smaller hook than usually recommended for the yarn. The materials in this kit include the yarn and wool for filling that will suffice for the whole piece if you crochet at the recommended gauge. If you crochet too loosely, you will need more yarn and filling, so, be careful with the gauge. 5 sc = ¾ in / 2 cm in width. All the pieces are joined with the WRONG SIDE out so the finished results will look like the original goat as much as possible. REMEMBER to make color changes on the right side so they won´t be visible when the goat is assembled. Crochet into both loops of stitch below unless otherwise specified. Color 1: Ch 65 and join into a ring with 1 sl st into 1st ch. Work around in sc (= 65 sts per rnd) until piece measures 3 in / 7.5 cm. Change to color 2 and continue in sc for 1 in / 2.5 cm. Change to color 1 and work around in sc until body measures a total of 6¾ in / 17 cm. End with 1 sl st. The body is now complete. The front of the body is worked as a circle (to be sewn to body´s foundation chain later). Color 1: Begin with ch 2. Work 7 sc in 1st ch. Always repeat from * to * around. Rnd 1: *2 sc in each st* = 14 sts. Rnd 2: *1 sc, inc 1* = 21 sts. Rnd 3: *2 sc, inc 1* = 28 sts. Rnd 4: *3 sc, inc 1* = 35 sts. Rnd 5: *4 sc, inc 1* = 42 sts. Rnd 6: *5 sc, inc 1* = 49 sts. Rnd 7: *6 sc, inc 1* = 56 sts. Rnd 8: *7 sc, inc 1* = 63 sts. Join with 1 sl st into 1st sc of rnd. Cut yarn and fasten off. Now the front piece is complete. The diameter of this piece should be 3 in / 7.5 cm when worked to specified gauge. Make another piece the same way for the back. The base of each leg is worked as a circle and then leg continues up from the base. Next Rnd: Now crochet in FRONT loops only and, at the same time, sc2tog 4 times evenly spaced around = 38 sts rem. Place marker and measure leg length from this point. Continuing with sc through both loops, work around for 1¼ in / 3 cm, change to color 2 and work 3 rnds. Change to color 1 and continue working around until leg measures 3¼ in / 8 cm from marker. The rest of the leg is worked back and forth as follows: 27 sc, turn with ch 1. Skip 1 st, 14 sc, turn with ch 1; skip 1 st, 12 sc, turn with ch 1; skip 1 st, 10 sc. Cut yarn and fasten off. Make the other 3 legs the same way. The front of the head is worked as a circle and then the head is worked up from the front. Rnd 3:*2 sc, inc 1* = 28 sts. Rnd 4: Work in FRONT loops only. *1 sc in each st* = 28 sts. Continue with sc through both loops. Rnd 5: *13 sc, inc 1* = 30 sts. Rnd 6: *1 sc in each st*. Change to color 2. Rnd 7: *1 sc in each st*. Rnd 8: *9 sc, inc 1* = 33 sts. Rnd 9: *1 sc in each st*. The rest of the head is worked with color 1. Rnds 10-11: *1 sc in each st*. Rnd 12: *10 sc, inc 1* = 36 sts. Rnds 13-14: *1 sc in each st*. Rnd 15: *11 sc, inc 1* = 39 sts. Rnds 16-17: *1 sc in each st*. Rnd 18: *12 sc, inc 1* = 42 sts. Rnds 19-20: *1 sc in each st*. Join with 1 sl st in 1st sc of rnd. Cut yarn and fasten off. The back of head is worked as a circle. oin with 1 sl st in 1st sc of rnd. Cut yarn and fasten off. Color 1: Ch 30 and join into a ring with 1 sl st into 1st ch. This piece forms the top of the neck. Rnd 1: *1 sc in each st* = 30 sts. Rnd 2: *9 sc, inc 1* = 33 sts. Rnd 3: *1 sc in each st*. Rnd 4: *10 sc, inc 1* = 36 sts. Rnd 5: *1 sc in each st*. Rnd 6: *11 sc, inc 1* = 39 sts. The rest of the neck is worked back and forth to shape back of neck which will later be sewn to the back: 11 sc, turn with ch 1. Skip 1 st, 10 sc, turn with ch 1; skip 1 st, 8 sc, turn with ch 1, skip 1 st, 6 sc. Cut yarn and fasten off. The top of the tail is worked around and the rest of the tail worked up from it. Rnd 4: Work in FRONT loops only and, at the same time, decrease with sc2tog 2 times evenly spaced around = 26 sts rem. Place marker on this rnd. Continuing with sc through both loops, work 1 rnd with 1 sc in each st. Change to color 2 and work 3 rnds. The rest of the tail is worked with color 1. Continue as est until tail measures 1¼ in / 3 cm from marker. Join with 1 st st into 1st sc. Cut yarn and fasten off. The horns are worked back and forth, folded down the length, and sewn together. Color 1: Begin with ch 6 + ch 1 to turn. Work 4 rows sc. Change to color 2 and work 2 rows sc. Change to color 1 and work 6 rows sc = 6 sts. Next Row: 1 sc, sc2tog, 3 sc = 5 sts rem. Work 3 rows sc. Change to color 2 and work 2 rows sc. Change to color 1 and work 7 rows sc = 5 sts. Next Row: 1 sc, sc2tog, 2 sc = 4 sts rem. Work 2 rows sc. Change to color 2 and work 2 rows sc. Change to color 1 and work 8 rows sc = 4 sts. Next Row: 1 sc, sc2tog, 1 sc = 3 sts rem. Work 1 row sc. Change to color 2 and work 2 rows sc. Change to color 1 and work 7 rows sc = 3 sts. Next Row: 1 sc, sc2tog = 2 sts rem. Change to color 1 and work 6 rows sc = 2 sts. Next Row: Sc2tog = 1 st rem. Work 1 row sc and then cut yarn and fasten off. Make the other horn the same way. All the pieces are joined with the wrong side facing out. Sew the front and back pieces to the body. Fill the body with wool before completely joining opening. Fill the legs and sew firmly to body. Sew longer part of each leg securely to the outside of the body. Don’t forget to add extra filling before you finish seaming. Join the head by sewing the back part together - don´t forget to add filling. Sew the foundation chain of the neck to the underside of the head. Turn the longest part of the neck to the back and then sew it securely to the back. Fill and sew the neck to the body. Fold each horn and seam down the length to form long narrow horns. Pull yarn in at the seam to round the horn. Sew the wider end of the horn to the head. Sew the point of each horn to the side of the tail. Beard (if desired): Sew fringe (approx. 2 in / 5 cm long) under the chin and carefully comb out to shape into a beard. The Gävle goat is now finished. Time for producing goat: approximately 36 hours, including 4 hours for assembly and finishing (this will vary by individual). Yarn alternative: Please be aware that the gauge (tension), yarn quantity and the shape of the work varies if you use another yarn (even in the same yarn group). To avoid problems: Read entirely through the pattern before you begin. Gauge (tension): Always knit/crochet a gauge swatch according to the recommendations. If you get a different gauge, try with a smaller or larger needle size. If the gauge isn't correct the work may be a different shape and size. To make it easier to follow the instructions, use a colored pencil or highlighter to mark your size. Chart: To make it easier to follow the chart, use a ruler under the on-going row. Tips för hand dyed yarn: Make sure you have enough yarn to complete your project. The colors may vary from time to time. To get a smooth color mix, you can alternate between two skeins: knit two rows from one and two rows from another skein. The range of movement for the garments in our patterns varies depending on the garment type, shape and design. 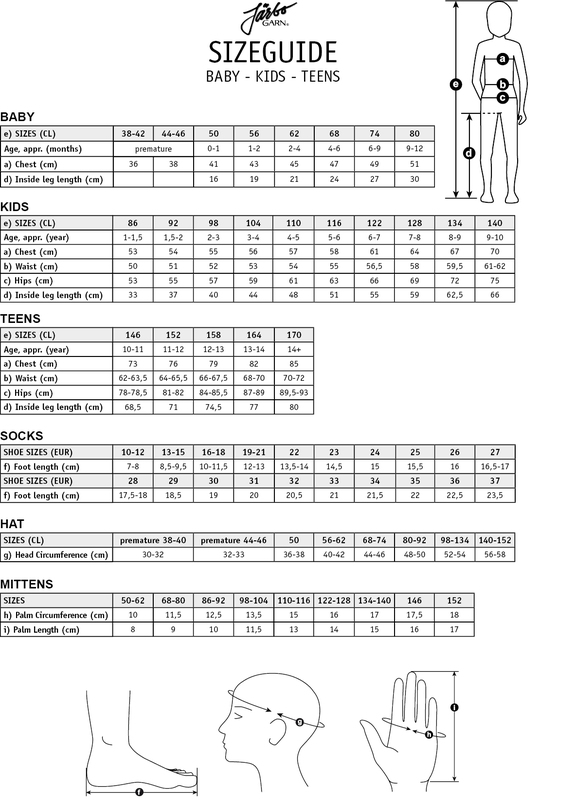 In order to find the right size, we recommend that you first measure all measurements directly on the body, according to the tables below. 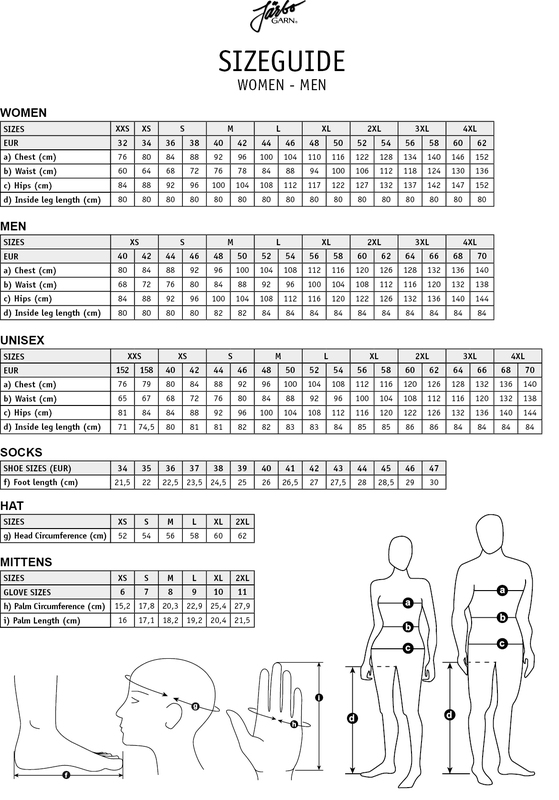 Then you decide the size of the garment yourself, based on how much movement you want the garment to have. Chest (a), waist (b) and hips (c) are measured around the body. Children's clothing is measured in centilong (cl),which is the same as the childs length. Premature = Children born before the week of pregnancy 38.